New kid on the block! 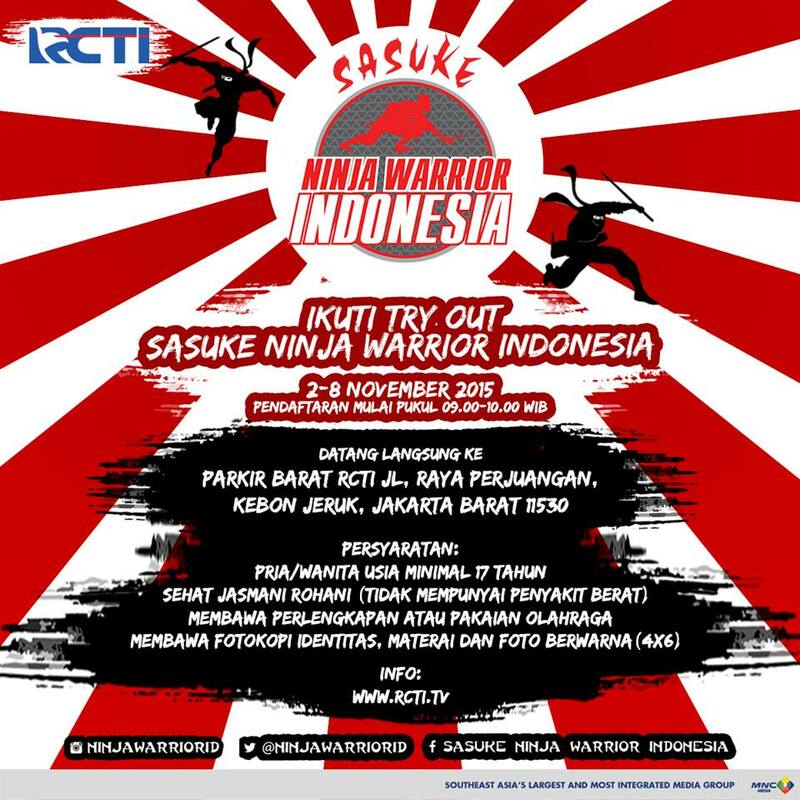 Sasuke Ninja Warrior Indonesia taping this December! I've mentioned earlier this year of the expansion of both the American Ninja Warrior franchise and the Sasuke (TBS) franchise (which are different licenses). Announced back in September, Indonesia is the next country in a string of franchise spin offs. For a while I wasn't sure which version was being expanded since the title had BOTH Ninja Warrior AND Sasuke on it's name. LOL Seeing the logo doesn't help change that notion (it closely remembers the G4/Ninja Warrior logo), however this tweet from Sasuke (Japan) Director Masato Inui 乾雅人 helped allay my fears. He's officially overseeing construction on their new set! TBS assured us that it's another 4 stage course so I'm curious what new stuff they come up with just for this new production. I remember seeing a lot of different ideas on Vietnam's set earlier this year (of which Inui oversaw production)! Indonesia has their official websites up! First is the official website run by the television station RCTI. They also have official Twitter and Facebook accounts. Seems trials have started (with a couple YouTube vids popping up here and there) and will continue on until November 8, 2015. Inui will be heading to Indonesia in the next couple of weeks to start production on their course. Taping for the show begins in December for their inaugural season! My hope is that we will be able to see the official product (worldwide) on YouTube (like we have with Vietnam and China so far). A couple weeks after that, Inui goes back again to Vietnam to start construction on Season 2 of Sasuke Vietnam! Inui put out an interesting tweet encouraging the Japanese to send in applications for an official Team Japan! On the heels of what happened in China and the fact that Vietnam last minute wanted a team event, it seems that they are actively working on getting Japanese involvement with each of the TBS produced events. Sasuke Japan is sadly annually now so the desire of competitors to compete throughout the year is still strong enough to warrant this type of competition. Hopefully all of these can be tied into Sasuke World Cup whenever that's up and running (which by all reports is still slated for sometime in 2016 with no firm date). Sasuke Vietnam had a wonderful showing on YouTube with their first season so I have high hopes for an equally strong showing on YouTube for Season Two! I just hope they don't have any tornadoes this season! LOL I really look forward to updates and behind the scenes for this upcoming season! Now with team competition set up 2 months in advance, competitors can properly train for this event without it being a last minute endeavor. If Sasuke China/Warrior X showed us anything, is that fans and competitors alike are interested in this type of competition provided it's run fairly (I'm looking at you NBC). So, more events like this is a great thing and hypes us up more for an official Sasuke World Cup run by TBS! THAT one I'm really looking forward to!